With all the stress of modern life it can often feel great to get away from it all and harken back to a time that felt simpler and more quintessentially idyllic. And what feels more perfectly American than a covered bridge? 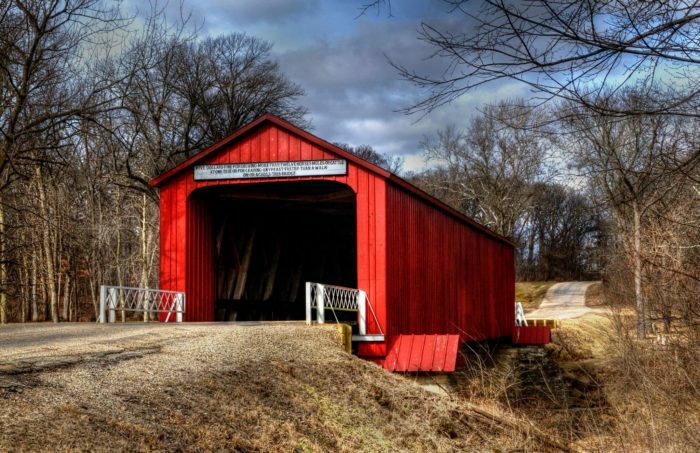 Whether you enjoy taking lovely fall drives through this gorgeous state or you just love the idea of capturing the beauty of the first snow fall, there is something about these rural covered bridges in Illinois that are pretty picturesque in all seasons and well worth the trip. 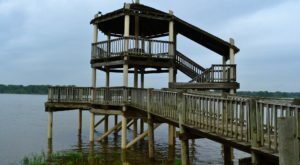 As you may be able to imagine, Chester was a pretty large trading post because of its proximity to the Mississippi River. In order to transport goods like corn and lumber on ox carts and wagons they needed a way to connect the two worlds to make trading a bit easier. Thus, in 1854, Mary’s River Covered Bridge was born. 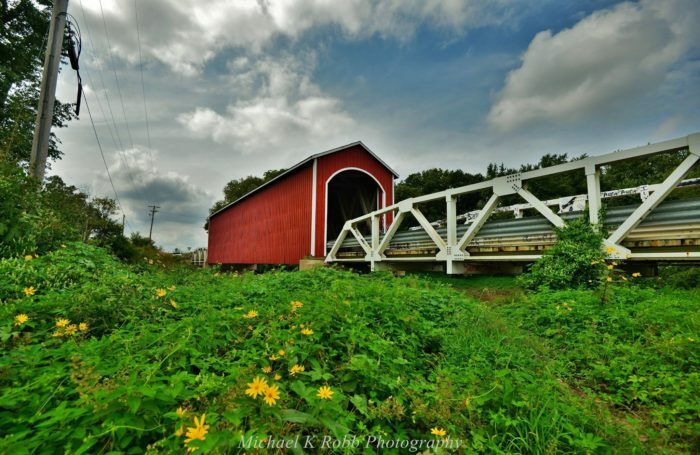 It’s the only covered bridge that remains in Southern Illinois and it’s the oldest bridge in Illinois. Spanning the Kaskaskia River, this 105-foot-long bridge was built in 1868 at around $2,500 and is located between Effingham and Springfield. It also happens to be one of the narrowest covered bridges in Illinois, only being a little over 10 feet wide. 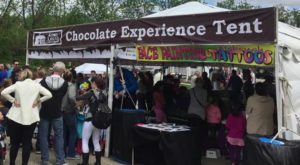 While you won’t be able to drive your car across, foot traffic is certainly welcome. 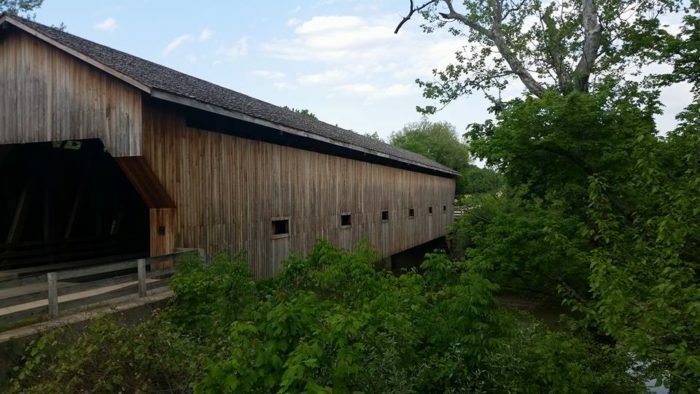 This bridge is believed to be the longest covered timber bridge in the US that doesn’t have restrictions. That’s right! This bridge can actually support large modern vehicles including semis. As the folklore goes, the original bridge that sits over the Embarrass River was built by none other than Abraham Lincoln and some of his family members. Over the years the bridge fell into disrepair, but was torn down and replaced with a new bridge in 2001. If you are heading down the Galena trail then you better make a quick pit stop at the Red Covered Bridge that lies over Bureau Creek. Built back in 1863, it was originally meant for moving livestock through. A sign on the bridge still reads, “Five dollars fine for driving more than twelve horses mules or cattle at one time or for leading any beast faster than a walk on or across the bridge.” So, while you may just want to leave the ox at home you can certainly drive your car across. Not much is known about this bridge besides the fact that it’s 45 feet long, spans the Kent Creek, and was built in 1970. 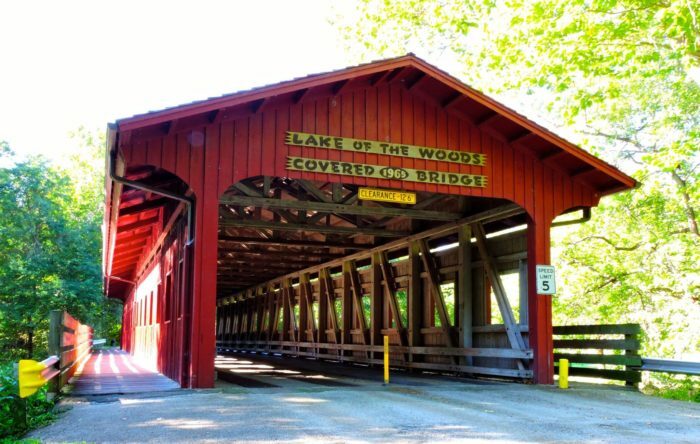 While clearly not as old as some of the covered bridges you’ll find in Illinois, it’s still worth a trip if you are a covered bridge buff. 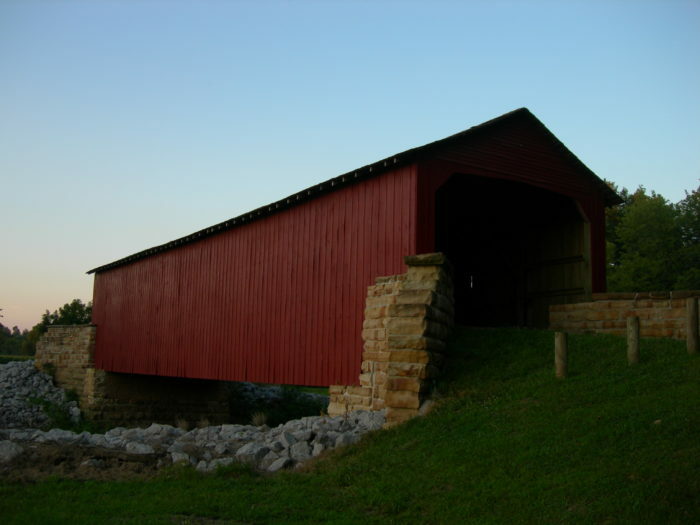 One of the five remaining 19th century covered bridges in Illinois, Sugar Creek Covered Bridge is also sometimes referred to as the Glenarm or Hedley Bridge. While the original bridge was constructed in 1880 it was given a couple of facelifts in 1965 to keep it preserved. 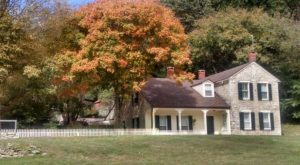 In fact, the local historical society even created Pioneer Park near the bridge to recognize Robert Pulliam, who settled the area in the early 1800s. This bridge that spans a small portion of the Sangamon River is actually a pretty popular site to check out. 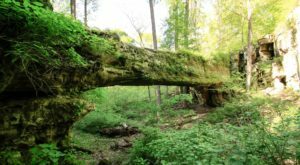 That’s because it is nestled in the Lake of the Woods Forest Preserve, which offers nearly 900 acres of lush, beautiful nature. 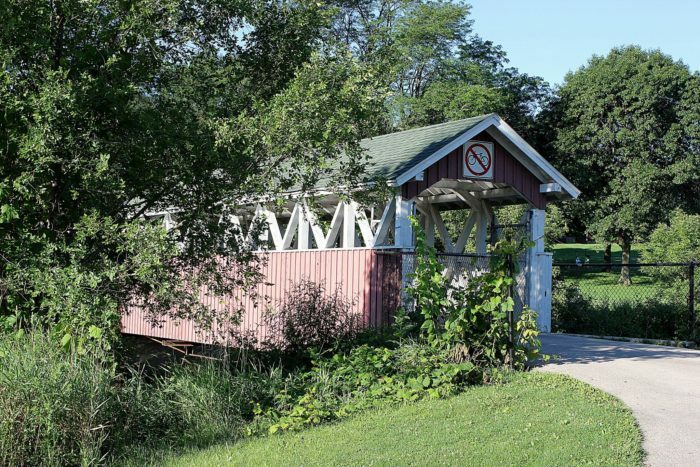 After you check out this covered bridge, take in a round of golf at the Lake of the Woods Golf Course or soak up some history at the Museum of the Grand Prairie. 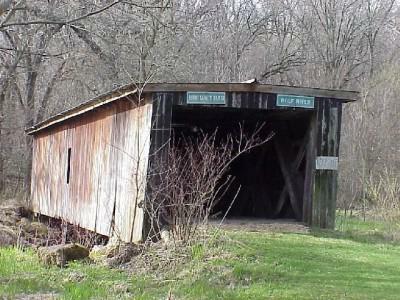 This is one of the original covered bridges that still remains. 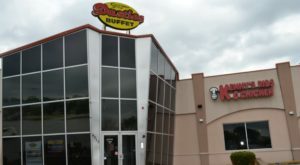 It has stood strong since it was built in 1890. 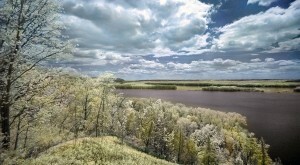 The bridge can be found just east of Rockford and crosses the Kinnikinnick Creek. Of course, this bridge is on private property so you’ll most likely require permission before you can cross it. This bridge has quite the interesting history. 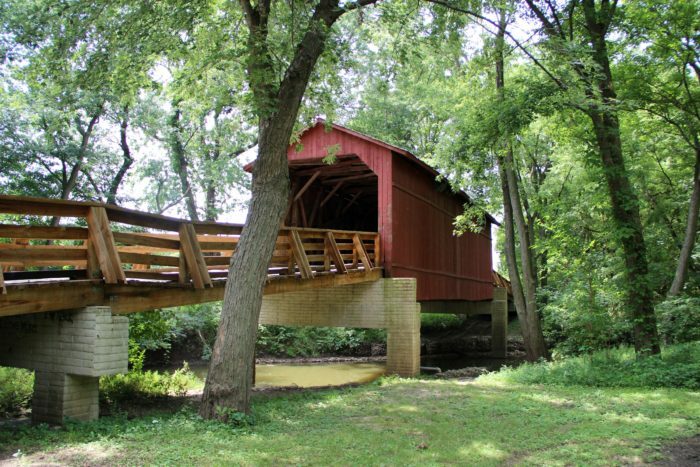 The original bridge that spanned the Spoon River was built around the 1840s. In 1974 a cover was built for it. 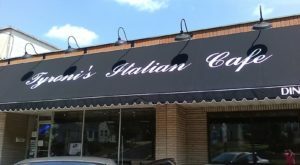 It saw a lot over the 150 years before it met its fate in 1994 at the hands of an arsonist. 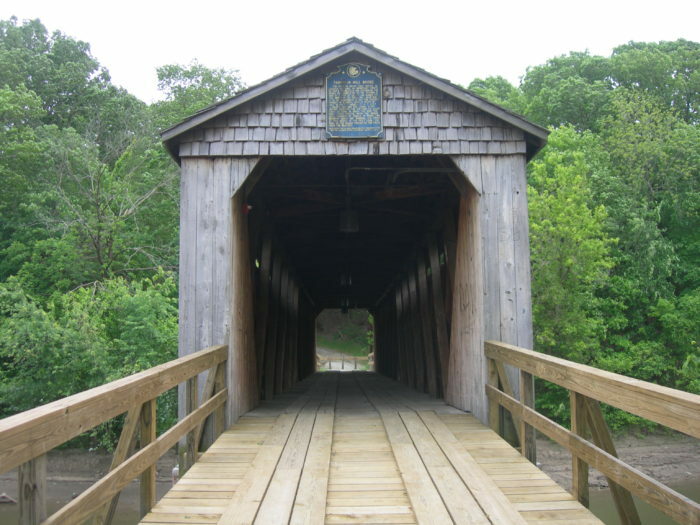 Fortunately, the state saw the value of having this quaint covered bridge rather than a concrete one, and so they created a reproduction of the 1840s bridge in 1999. It’s time to pull out the map, set up your GPS and get out of Dodge for a little while. You’ll enjoy feeling like you’ve stepped back in time when you check off each covered bridge on your list. 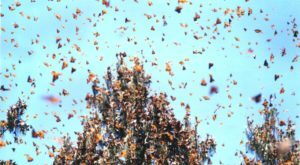 Plus, being surrounded by some peace and quiet might just be the breath of fresh air you were looking for. 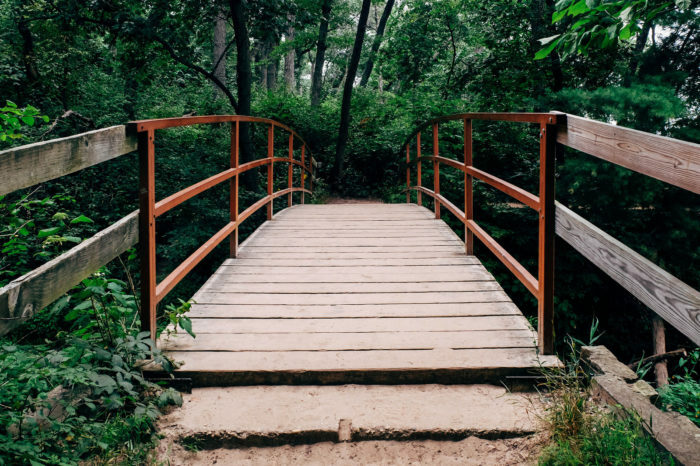 If you’ve already checked out any of these bridges, we would love to hear from you in the comments. Let us know which ones were more beautiful in person or if there is a certain time of the year that’s ideal for checking out some of these nostalgic structures.